"When an American says that he loves his country, he means not only that he loves the New England hills, the prairies glistening in the sun, the wide and rising plains, the great mountains, and the sea. He means that he loves an inner air, an inner light in which freedom lives and in which a man can draw the breath of self-respect." Enjoy this beautiful day, my friends ... see you here again very soon! Rabbit, Rabbit ~ Happy July! "Like a little sailboat in the harbor at eventide, we are becalmed in July. Even the birds seem quieter; all through the day there are periods of deep quiet, a "pervading symphony of peace." We seek the coolest corners, the easiest tasks. From the fields wafts the scent of new-mown hay, and from somewhere in the distance drifts the sounds of the mowers ... On the Fourth of July we tug at the bell rope in the barn and put up the flag to wave in the hot breeze, remembering that after John Adams signed the Declaration of Independence on the first American Fourth of July, he wrote his wife Abigail that he hoped Americans would always make this day one of rejoicing and merrymaking. We follow his wishes willingly." What are your favorite things about July? 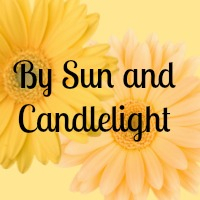 If you have a moment, leave me a note in the comments box below. Well, I hope your day's going well, my friends ... I just got back in from a jaunt across town with the boys. We first stopped at a local farm for some pies and honey. Then another stop at the library for this week's hold ... and now we're back home for lunch. A nice, quiet day ... very hot out there though! ... looking forward to another episode of "Father Brown" this evening. Enjoy your Tuesday, my friends ... see you here again very soon! Keep your eye on the grand old flag! Enjoy your Thursday, my friends! So of course, now I'm wondering: Is there an apple you like best of all? Here's a recipe for the apples seen above, a delicious baked version filled with dried fruit and honey. Wouldn't these make a cozy, nourishing breakfast on a cold March morning? And if you're looking for some more appley ideas, here's a link to a post I did on Johnny Appleseed Day last year. In the interest of keeping it simple with little ones - why not head to the library to pick up a book or two on apples (there are bound to be lots!) and perhaps stop at the market to buy a few apples? (See how many varieties there are!) Or if the weather is cooperating, visit your local orchard and see how the apple trees are faring. Are they showing signs of life yet? Beautiful illustrations, and a sweet imaginative story. It nicely describes the different seasons in an apple tree's life. So there's a few thoughts for this Tuesday, my friends ... but wherever your day takes you, I hope you enjoy it! Thanks so much for stopping by ... I'll see you here again sometime soon! Have a Wonderful Wednesday, my friends! Well, I've got my sparkly flag pin on, and I've added little flags to all our planters ... I also hung our large front door flag this morning. Here's a post from last year with a bunch of ideas for celebrating this national holiday and here's an even earlier post about flag eittiquette. It also happens to be National Strawberry Shortcake Day, so that's a must-do ... we'll pick up some fresh strawberries at the farm this afternoon and I'll whip up some shortcakes and cream to "go with." 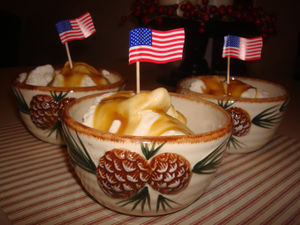 Add a little flag stick to each serving and voila ~ a tasty and timely dessert! Hope you all have a great Thursday ... I'll be back later, my friends! 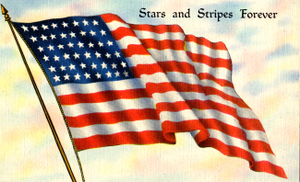 It's Memorial Day here in the US ~ a day of parades, cookouts and cemetery services. On this day, we honor those who have fallen, and give thanks for all those who serve. Freedom is not free ... but it sure is precious. Today is also the "unofficial" start to summer when pools are opened and grills are fired up. We don't have a pool, but you can be sure we'll be grilling today! However you plan to celebrate - playfully, prayerfully, patriotically - I hope you have a wonderful Memorial Day! And God Bless America, our Home Sweet Home. Listen (or sing if you're inclined!) to patriotic music. 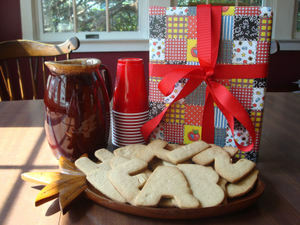 Make a flag cake or flag-shaped cookies. Serve up a "patriotic" breakfast: spread a piece of toast with cream cheese, dot a few blueberries in the upper left hand corner and make stripes with lines of diced strawberries. Or, even easier, just sprinkle blueberries and strawberries (or raspberries) over vanilla yogurt. Design a "family" flag. What would it look like? What symbols represent your family? Haul out, inspect, and hang your American flag for the summer. Organize an impromptu neighborhood parade. But most of all, try to take a moment to admire our beautiful flag and honor it in any way that is fun and feasible for your family. Have a great Tuesday, my friends! Today we're celebrating the blessings of family and freedom! Here's to a Happy 4th of July! The show is rated PG, and I'm sure it's quite tame; still I'll watch it first before showing it to the boys. 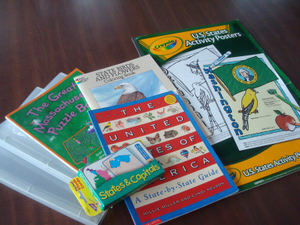 You can see a preview at the PBS site and there is a teacher's guide available, too. 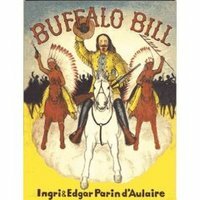 I missed the program on Kit Carson which aired earlier this month; but it seems you can view it online here. There are plenty of resource links, too. "Let us try through the week's talks, stories, lessons and plays, to draw a clear picture of Washington's impressive character. Let us tell those stories of his childhood, youth and manhood which will enable the children to see for themselves some of his strong and noble traits, instead of merely memorizing the fact that George Washington was a good man from our assertations. The impression upon their minds and hearts will thus be deeper and truer. Mix and boil first three ingredients to the soft ball stage. Add cream or evaporated milk and vanilla. Stir. Serve over ice cream (or maybe bread pudding). Goal: To cover two states a week till we've covered them all. 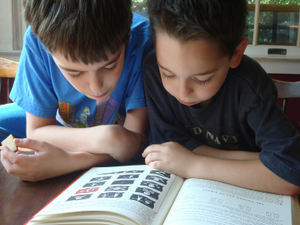 M-F: Boys complete one puzzle page from the MA book; file behind MA section. On Monday: color two posters, one for each state; hang up in learning room. Read about state in guidebook. Place sheet in binder behind appropriate regional divider. Color in state on blank US map. I'm not requiring memorization at this point, just familiarity. So far this has been a fun and easy way to acquaint ourselves with the country. Next year we will focus our history on America from 1850 to the present and I anticipate a more in-depth study of US geography at that time. We'll also take time to learn about the Saints of America. I've been keeping ideas for celebrating each of these holidays in my seasonal planning notebook (the one where I file my themes and plans outlines). I try to keep the activities simple and family-friendly, and to weave in our Faith as I can, too. But right now I'm off to get the day rolling. I hope yours is a good one, whatever your plans! 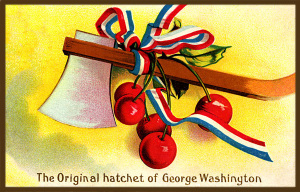 George Washington was brave, we know; he loved this land we hold so dear. And when his birthday comes around, his noble name we cheer. **And Lincoln, who was strong and true, his birthday too, we celebrate. So raise the flag and sing the praise of heroes, good and great. Links for Lincoln ~ Take Two! "Unfortunately, with the exception of Independence Day, little attention is paid to the observance of patriotic holidays. As the origins and meanings of these very special days have slipped through the cracks, we have lost one of the most important legacies we can pass on to our children. There is no better place to begin restoration than with a homegrown observance of Washington's and Lincoln's birthdays." Make a yummy pretzel cabin. Paint a log cabin birdhouse. Play with your Lincoln Logs. 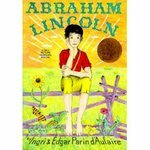 Read Abraham Lincoln by Ingri d'Aulaire. Or Abe Lincoln: The Boy Who Loved Books by Kay Winters. Make a lucky penny pin. Check out lots of Lincoln websites. Read a poem about him. Go on a virtual field trip. And then test your knowledge about Honest Abe. How about a little copywork in praise of our February presidents? George Washington was brave, we know, he loved this land we hold so dear; and when his birthday comes around, his noble name we cheer. And Lincoln who was strong and true, his birthday too we celebrate; so raise the flag and sing the praise of heroes good and great. Are you on holiday today? Off to leaf-peep or watch a parade, perhaps? Well, it's a dark, rainy morning here and I am on my third - no, make that fourth - cup of coffee. That might sound like a lot to you, but believe me, it's sorely needed today. For some inexplicable reason, Earlybird was up really, really early this morning. I'm not going to tell you how early, it's just too crazy to say. No fever, no nightmares, no apparent discomfort of any kind. He was just up. Up, and ready to go. 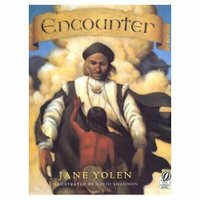 Over lunch I'll read aloud that timeless poem, the one that begins "In fourteen hundred ninety two, Columbus sailed the ocean blue ..." and I just requested Encounter by Jane Yolen at my local library. 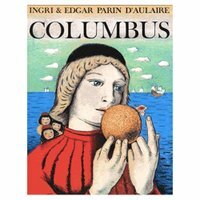 I've never read it before, but I understand it tells the Columbus day tale from a native boy's view. It should make for some interesting discussion. Oh! And how about this: a delicious spice cake? What a wonderfully fitting Columbus Day treat! And just the thing for such a damp, dark afternoon. All right, one more sip and I'm off. However you're spending your holiday, I hope you enjoy it. Yesterday afternoon the boys and I had a little teatime in celebration of our first week back to "school." After our summer-send off last week, I wanted to serve something that just said fall - in spite of the soaring temperatures outside, lol - so first on the menu, in place of hot tea, was fresh-pressed apple cider. (It's back in the markets again - have you seen?!) I offered to warm it up but it was unanimously decided that cold crisp cider was just the ticket for such a warm September day. Now for the snack ... 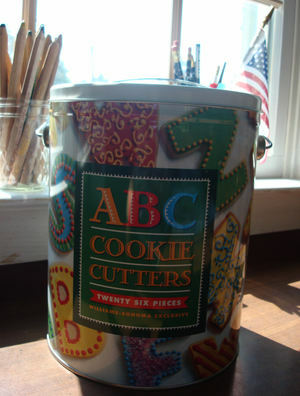 I was thinking of an alphabet theme, especially for Earlybird who's beginning kindergarten at home this year. He just loves letters! Well, paging through one of my old journals the other day, I came across a clipping I'd saved from Family Fun magazine. 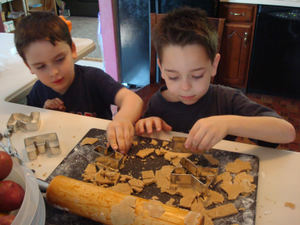 According to the article, in Colonial America, when children learned the alphabet, their families celebrated by making gingerbread letters. The younger two got in on the action too, of course. 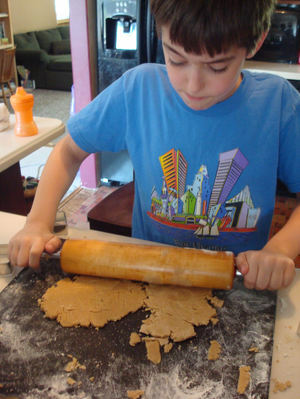 Actually this was taken near the end of baking when the scraps were left to be played with. 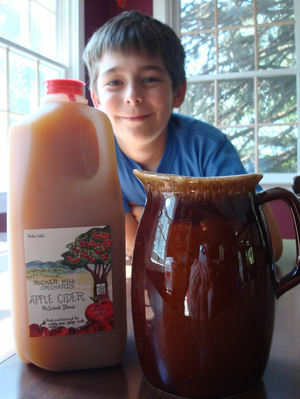 This is the smile of a boy who is thrilled it's apple cider season again, a culinary delight second only to the appearance of eggnog in late October. I shooed the boys off to play and set up the table - the platter is a wooden pineapple tray that belonged to my grandmother years ago. The pineapple was a traditional symbol of welcome in Colonial America. 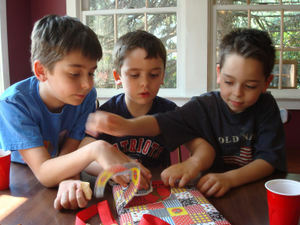 The cookies looked (and smelled) good, but it was the brightly wrapped package that caught the boys' attention first. "Dangerous? 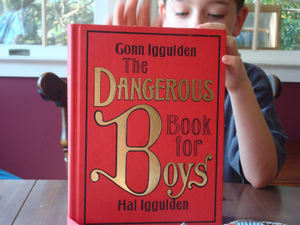 What's so dangerous about a book?" asked Crackerjack. And so our new year was officially kicked off, and as if on cue, the mail arrived just as we finished up tea - bringing with it our approval letter from the town. What great timing! That letter will be stored securely in our files, but the memories of today will be filed away too - slipped inside the yearbook of our hearts, a book I hope will grow fat with experiences all year long. I can't believe Independence Day is here already! It seems like we were just firing up the grill for the first time and here we are knee-deep in summer! 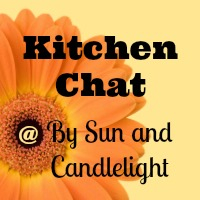 Tomorrow we are having a small luncheon for my folks, my grandmother and my cousin who is visiting from New York. In the morning I'll collect some of the pretty white yarrow growing wild along the back fence; it will look nice in my rustic brown pitcher, along with a small flag for the day. I was tempted to buy one of those red-white-and-blue bouquets at the grocery store (the waay overpriced ones) but I thought of all the wildflowers growing in our yard and decided to go the simple route. I have a tablecloth all picked out and pressed, and since we're a small group, we'll go with the good dinner dishes, rather than paper or plastic. 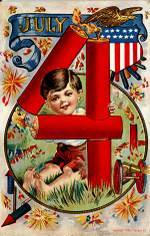 I had seen some adorable 4th of July crafts at (where else but) Martha's but we never got around to making them. (Go figure, lol.) We will pop in a CD of American classical music; it's been one of my favorites for years. By the end of the day we'll start listening and watching for the neighborhood fireworks ~ that is, unless nature's fireworks kick in first. Thunderstorms are predicted for the afternoon. The second in SIGNAL but not in REPLY. The fourth is in ONE but isn’t in CROWD. The eighth is in SPARK yet not in GLOWED. The WHOLE is _ _ _ _ _ _ _ _ _ noisy and bright! From a 1955 issue of (my dad's!) Jack and Jill magazine; answer in the comment box below! Happy Fourth of July!